Despite prevailing arid conditions, the diversity of terrestrial and freshwater animals in the Middle East is amazingly high, and the region's position at the crossroads of the Palaearctic, Afrotropical and Oriental Realms results in an exceptional biogeography. Marine biodiversity of the Arabian Seas Region is among the highest on Earth. 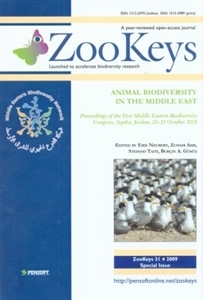 This special issue of ZooKeys contains a collection of 15 papers presented during the First International Congress: Documenting, Analysing and Managing Biodiversity in the Middle East, which was held in Aqaba, Jordan from 20 to 23 October 2008. Contributions address a wide range of themes and taxa, including an introduction to the Middle Eastern Biodiversity Network, the diversity of macrozoobenthos in the Gulf, intertidal scale worms, terrestrial isopods, terrestrial mollusks of Turkey, the insect fauna of the United Arab Emirates, biodiversity and zoogeography of weevils, a new species of tooth-carp, mapping terrestrial reptile distribution, phylogeny and taxonomy of vipers, bird migrations, effects of farming on birds, and mammals in Turkey and Syria.